Many skeptical Yorkie owners and breeders, absolutely refuse to believe that the Parti colored Yorkie is anything other than a recent “behind the kennel bred” mutt. They say: “There is NO white gene in our Purebred Yorkies” or “There is NO record of any Yorkie ever breeding to a white or parti colored dog” or “No show breeder who’s been breeding and showing for 30 or 40 years, has ever produced a parti colored Yorkie.” I’m going to try to educate people on color genetics, recessive genes and how the Parti gene remained hidden in the Yorkshire terrier breed for years. We know from our Yorkie history, that early records were not kept on the foundation breeding stock. I seriously doubt, that back in the days where spaying and neutering was not done, that the farmers and working class families didn’t have the “occasional” unplanned pregnancy in their canines. If anything, it happened more then, than it does today. History also notes that the Maltese was bred to the Yorkshire terrier to enhance the texture and length of the Yorkshire terriers coat, since most of the early dogs thought to have started the breed, were broken haired dogs with shorter, coarser coats. It’s documented in some of the earliest records that the foundation stock of our breed, were cross-bred dogs and dogs without pedigrees (who’s heritage is unknown). Even if these dogs didn’t look parti colored they could very well have harbored the recessive Parti gene in their DNA makeup. Whether their mother/father, grandmother/grandfather or great grandmother/great grandfather … was parti colored, no one would really know, since record keeping at that time in history, was little to none. The Parti gene can only be expressed if a parti gene carrier is bred to another parti gene carrier. 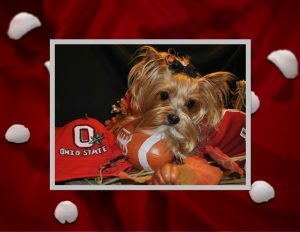 A carrier will look like a traditional colored Yorkie but is born with maybe some white on it’s chin, chest and/or feet. In this case where a parti carrier is bred to another parti carrier, 25% of the offspring will be traditional Yorkies (not carrying the gene), 50% will be traditional colored Yorkies who do carry the recessive parti gene and 25% of the offspring will be actual Parti colored dogs. AKC has allowed Parti colored Yorkies to be eligible for registration since 2000. Prior to that time, parti colored offspring were normally given away without papers or destroyed (yes, destroyed). I know of several breeders who have destroyed a litter of “surprise” parti colored pups. The most prolific known line of Parti Yorkies is the “California line” or Nikko’s line. These dogs are all descendants of an AKC Champion named Nikko’s Rolls Royce Ashley. Two dedicated breeders in California, fought to get this line of Parti colored Yorkies, registered by AKC. This line of Parti carriers and Parti colored Yorkies comes from a well known show breeder who’s been breeding and showing for over 40 years. Forty-two litters and generations of dogs from this line were DNA’d prior to AKC’s approval of registration. The Yorkshire Terriers breed standards have changed over the years. The “Standard” color is blue and tan, any other color is considered to be “Off Standard.” Until the new color disqualification rule went into effect, off standard colored, black and tan and black and gold yorkies have entered the show ring and won their champion status. Standards have changed and not only do we now have smaller sized dogs than in the late 1800’s, but some of our “off standard,” darker coated dogs have been allowed into the show ring. Parti colored Yorkies are healthy animals and they are not a genetic freak of nature as some people, groups or websites suggest. In this day of scam artists and people looking to make a fast buck, my suggestion is to buy from reputable breeders who have their dogs DNA’d and/or their dogs are from known lines of Parti producing dogs. There are other Yorkie lines of parti carriers and producers but the California line is the best known. So do your research, get references and have an open mind. This gene has been in some of our Yorkie bloodlines for years and years and years … and if you think it’s not possible, don’t be surprised if one day, your own purebred Yorkie produces a pup of a different color!